Our 2017 Tikal Guatemala Calendar has miles of Mayan ruin concealed in knotted jungle vines. Personalize it for the perfect gift. Photographs to inspire travel: Scale stairs to outstanding canopy views. Spot ruins lunging through tree tops. Coatimundi and wild turkeys meander through the trails; indifferent to your presence. Hear howler monkeys echo in the distance, or if you’re lucky, with observant eyes you’ll spy one snoozing on a tree limb and ponder why he doesn’t slide off. These are the sights and sounds of Guatemala. 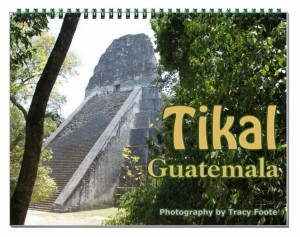 Escape to Tikal each month as you turn calendar pages revealing unique views of these Guatemalan ruins. Each month your wall will have a unique photo featuring the famous ruins and foliage. You can customize it and choose from three different wall sizes. Tracy Foote first visited Latin America in high school. Her mother took her and two of her brothers to Monte Alban, Oaxaca (Mexico). The travel bug was set and she continues to travel through South America today, photographing unique places and creating a unique gift to inspire others to explore the Mayan culture.